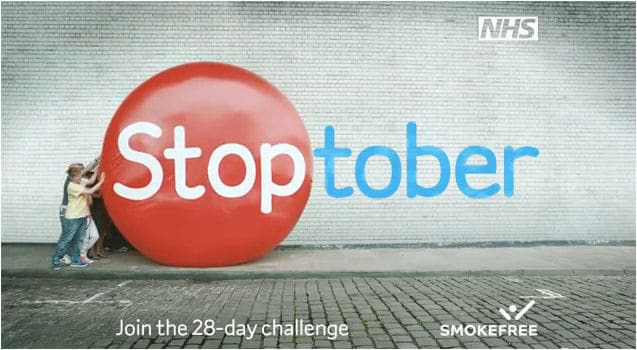 Stoptober is a Public Health England Campaign and part of the One You health campaign that is held every October with the aim of helping people quit smoking. According to Cancer Research UK, tobacco is the leading cause of preventable death in the world, causing at least sixteen different types of cancer. There are a vast number of health benefits to quitting smoking, and research has shown that if you can stop for 28 days, you are five times more likely to be able to give up smoking for good. There is also evidence that ‘social quitting’ i.e dividing to quit with others, increases the chances of permanently quitting smoking. Stoptober aims to provide the support and resources to allow people to do this.